I did at last receive my rejection from Cave Wall (www.cavewallpress.com), and I have to say, if I weren’t already happily married with child etc, I would totally fall in love with the editor. Seriously. That was the single greatest rejection ever! — loaded with comments & praise — subscribe now, Rhett (the editor) is awesome, she deserves beaucoup rewards for such generosity! And as I mentioned earlier, it’s an excellent journal, too. I won’t go so far as to say a great rejection is better than an acceptance, but I’ll be carrying this envelope around with me for a while. That’s how Vincent speaks, one word, full stop, then the next. And no more than three words in a row. But we understand each other, and that’s a constant revelation: we look at each other in utter astonishment several times every day. So it’s snowing again, very hard, much much snow. It’s been snowing since early December. You’d think we lived on a Great Lake the amount it’s snowed this winter. I’m almost beyond the whining to simply being stunned — how much can it snow in one winter anyway? muting the music in the pines. while the self sleeps on. is telling a story two miles long. Dead trucks for sale in the yards. at bed time comforts me. 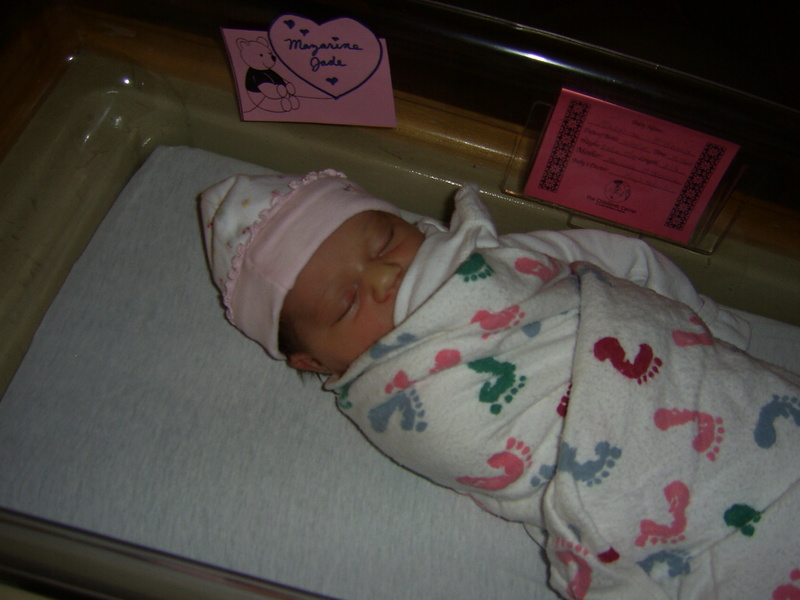 Welcome, Mazarine Jade McKenzie, born February 24, 2008, at 4:12pm! Weight: 8 lbs, 5.25 oz. I’m sitting in bed with my new laptop, cat at my feet. Vincent’s asleep, Lance went for a walk — silence but for the ticking clock. Serene winter evening. Let’s hope it doesn’t all go to hell. In terms of small presses, Graywolf Press is practically a venerable graybeard. It’s been around a while now, it’s a very successful press, their books get reviewed widely, and distribution is by Macmillan, who also distributes St. Martin’s Press, Henry Holt, and Farrar, Straus & Giroux. Graywolf books are even in the back of the FS&G catalog. This is great visibility for a small press. Colosseum, by Katie Ford. June, paperback, $15.00. A new book of poems from the poetry editor of the New Orleans Review. Excerpt: If you respect the dead/ and recall where they died/ by this time tomorrow/ there will be nowhere to walk. Matter of Fact, by Eamon Grennan. June, paperback, $15.00. Excerpt: Don’t look back. Think Orpheus. Pillar of salt./ One breath, then another. Sweat of apprehension./ Still life with wind and breadcrumbs. Letters to a Stranger, by Thomas James. Introduction by Lucie Brock-Broido. July, paperback, $15.00. A new book in the Graywolf Poetry Re/View Series, edited by Mark Doty, which is dedicated to bringing essential books of contemporary American poetry back into print. Excerpt: I will last forever. I am not impatient–/ My skin will wait to greet its old complexions./ I’ll lie here till the world swims back again. As a bookseller, my knowledge can be limited to the catalogs I receive, the sales reps I meet. So I know Copper Canyon Press, Tupelo Press, and a whole host of others I hope to cover, are distributed by Consortium/ Perseus/ PGW / Whatever they’re calling themselves these days. Small Press Distribution (SPD) distributes a continent of small presses. And they’re (SPD) non-profit. (I wish their catalog was more like Consortium’s, which gives each frontlist book at least half a page. I have to work very hard to read an entire SPD catalog.) Being somewhat plugged into the poetry blogosphere has also introduced me to some fantastic small presses. All of which goes to say that, while I’m gathering intel, it’s easy to miss good stuff, especially if a press doesn’t have a distributor or great online visibility, so if you have a favorite small press, please, go ahead & tell me about it! How else am I to learn? Vincent is much calmer this evening, sitting at the table eating his blueberry “ee-gurt” (i.e. yogurt), but last night was an entirely different story. Among another unspeakable acts, he decided to eat a chunk of soap — I guess it looked creamy & delicious to him — but oh, the reaction once it was in his mouth — he yowled & yowled. You’d think he’d eaten poison. He’s jealous, he wants me to get off my new toy, a “new” laptop I bought at this great used typewriter store in Amherst. Very cheap, it’s a used PowerBook, a big step up from my old ibook — and it has wireless! Whee! Is that raccoon we’d watched for every day. Her meaning now is more than I can stand. For giving love, and for withholding it. Things seen up close enlarge, then disappear. Tonight this small room seems too huge to cross. And my life is that looming kind of place. More so than I seem able to explain. Are tiny, tiny on my windowpane. Women Poets on Mentorship: Efforts and Affections, edited by Arielle Greenberg & Rachel Zucker. May, paperback, $24.95. Includes Beth Ann Fennelly on Denise Duhamel, Katie Ford on Jorie Graham, Aimee Nezhukumatathil on Naomi Shihab Nye. This is very exciting — I’d love to see the full table of contents. A Murmuration of Starlings, by Jake Adam York. February, paperback, $14.95. This collection elegizes the martyrs of the civil rights movement. The Sphere of Birds, by Ciaran Berry. February, paperback, $14.95. I love the musicality of Berry’s poems: …the sky alters in seconds, shine to shower,/ and harsher truths hit home hour after hour–/ the sundew snagging flies, settling to eat,/ a fat gull’s fractured keen that cuts through stone. Azores, by David Yezzi. March, paperback, $12.95. A new book of poems by the executive editor of the New Criterion. Still Here, Still Now, by Robert Pack. April, hardcover, $22.00. Described as “one of America’s most eminent nature poets,” this is a major new collection, clocking in at 128 pages. Chameleon Hours, by Elise Partridge. April, paperback, $15.00. Sad rower pushed from shore,/ I’ll disappear like circles summoned/ by an oar’s dip. I want this book, too. Blessings for the Hands, by Matthew Schwartz. April, paperback, $14.00. Fireflies/ apparently stumbling.// I slapped one on my leg./ Its blood glowed. This looks promising. The Endarkenment, by Jeffrey McDaniel. April, paperback, $14.00. The one & only poetry workshop I’ve attended was taught by McDaniel, and it was a very positive experience. He’s a dynamic reader also. So there we are, done with the university presses for this season. I’ve skipped Yale & Harvard, and perhaps will have to make up for that, but for now, this will do. Don’t you think? Vincent and I decided to go for a walk today before the big storm arrived, and, as is customary, we ended by heading for the Glacial Potholes. Vincent was carrying a large chunk of frozen snow that he was keen to pitch into the rushing water, and I let him because, well, he looked so determined and adorable doing it. This story could not possibly end well. As he carried his little iceberg, Vincent tripped on another, and smacked his face into the one in his hands. He responded very well, actually, crying briefly, and then pointed to the Potholes and cried, “Waterfall! Waterfall!” so we continued our walk, but I’m ever so thankful that I at least had a napkin in my pocket to press to his bleeding nose. He looks like he went a round or two in the ring with Tonya Harding.